Visit flyawaywithnick.com and enter the Fly Away With Nick Sweepstakes 2018 for a chance to win a trip to Universal Orlando Resort for the VIP Preview of the ride Fast & Furious SuperCharged and meet Jace Norman from Nickelodeon’s Henry Danger. Who Can Enter? The Fly Away With Nick Sweepstakes is open legal residents of the 48 contiguous US and DC who are between 6 and 21 years old at the time of entry or parents of children who are between 6 and 21 years old at the time of entry. Void in AK, HI, Puerto Rico and where prohibited by law. When To Enter? Sweepstakes starts at 12:00:01 a.m. ET on January 15, 2018 and ends at 11:59:59 p.m. ET on February 11, 2018. 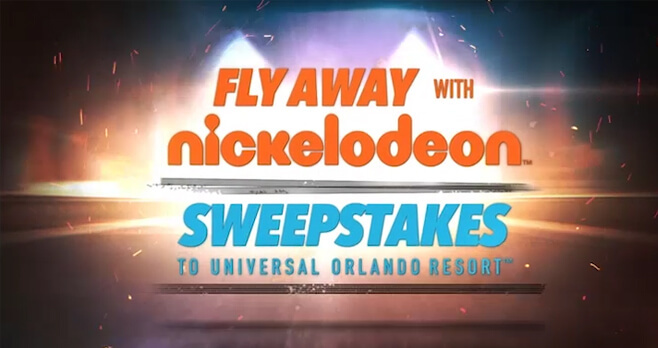 What Is The Fly Away With Nick Sweepstakes Prize? The Grand Prize consists of a 4 day/3 night trip for four to Universal Orlando Resort in Orlando, FL. Who Are The Nickelodeon Sweepstakes Winners? For a winner list, send a self-addressed stamped envelope with proper postage affixed to “Fly Away with Nick Sweepstakes to Universal Orlando Resort” c/o Marden Kane, Inc., 575 Underhill Blvd. Suite 222, Syosset, NY 11791-3416 for receipt by April 12, 2018. I love Jace Normen and a second I saw the first epesode ever I knew it was my show. So I really want to meet Jace Normen. I really love the show Henry Danger and Jace Normen and the first second I saw the first epesode ever I knew it was my show. And I really want to meet Jace Normen. I am Jace Normen’s BIGEST FAN!!! I love the show Henry Danger! I can’t wait to know if I am the winner or who is! I’m so exited I hope I’m the winner Jace Normen if you are seeing this plaese make me the winner I mosly want it to see you! And LOVE your show Henry Danger And I have everything in your show that you give out like the gum and everything. so plaese make me your winner!!!!!!!!!!!!!!!!!!!!!!!!!!!!!!!!!!!!!!!!!!!!!!!!!!!!!! !